The Lexmark E322n monochrome laser printer is ideal for personal or small workgroup use, with a speed and power that belies its compact size. 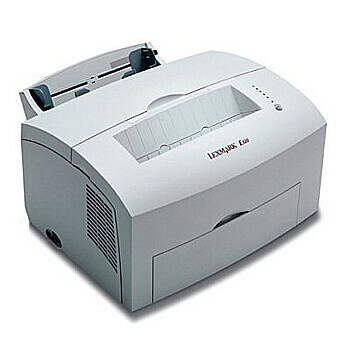 It produces high-quality output at 16 pages per minute, with the 133 MHz process and 8MB standard memory enabling users to print even complex jobs quickly. Designed for ease of integration into existing environments, it provides complete application flexibility with PCL 6, PPDS & PostScript Level 2 emulation standards. The device also combines an in-built Ethernet port and a USB port. The Lexmark E322n weighs 9kg and has dimensions of 221 x 380 x 362mm, making it a good fit for desktops. The maximum monthly duty cycle is approximately 15,000 pages and the first page out takes 12 seconds. Its print resolution is 300 x 300 dpi, 600 x 600 dpi, 1200 Image Quality, with a standard input capacity of 150 pages up to 400 pages, and an output capacity of 100 pages. It has a 100-sheet output tray, a 150-sheet input tray, a manual duplex, a single-sheet exit and a single-sheet manual feed. The Lexmark E322n is designed to grow with any business combining options such as expandable memory, networkability, a flash memory card to store fonts, and a second input drawer. It also has a flash memory card to store fonts, forms and macros. It supports a variety of media, including envelopes, transparencies and card stocks. Lexmark’s MarkVision Professional management software enables users to manage the network with efficiency and ease. The Lexmark E322n is a compact, powerful desktop device that is suitable for personal and small business use, but it is limited to monochrome output, making it an unsuitable option for larger organisations and those with more complex printing requirements.